Wolfe Lowenthal, born in 1939, is a direct student of Cheng Man-ching (who was referred to as ‘Professor’, by his New York students), studying with him in New York from the mid 1960s until Professor Cheng returned to Taiwan to die in 1975. ​In the US in that turbulent decade of cultural upheaval and social change under the influence of the Vietnam War, the peace movement, and the emergence of psychedelia, Professor Cheng’s tai chi school offered a haven of peace. Wolfe Lowenthal writes of leaving his first class with Professor Cheng feeling as though he was walking on air. He was deeply impressed by Professor’s gentleness, compassion and power. Another path opened for him, leading away from the alienated, macho notions of masculinity dominant in the 1950s. ​Meeting Professor Cheng had the quality of an epiphany for Wolfe, who, from that moment, made studying, writing about and teaching Cheng Man-ching’s tai chi his life’s work. Wolfe was also engaged in screen-writing and the anti-Vietnam war peace movement. Wolfe Lowenthal now lives in Amherst with his family, writing his monthly on-line journal ‘Tai Chi Thoughts’, teaching tai chi, running his school ‘Long River Tai Chi Circle’, and teaching an annual international tai chi seminar. Long River Tai Chi Circle has branches in USA, Spain, France, Czech Republic, the Netherlands, Colombia, Scotland and now England. 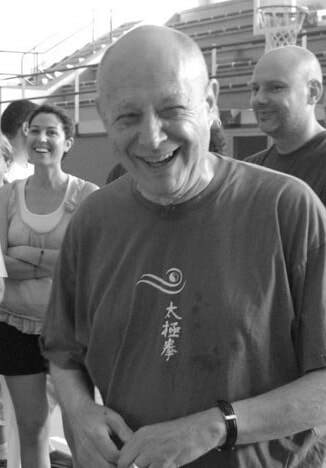 Wolfe Lowenthal is the author of three influential books on Cheng Man-ching and his tai chi.